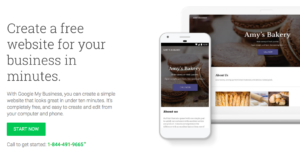 Recently, Google launched a new service that made it even easier for businesses to launch websites. Not all businesses need a custom website. I’m sure this website builder from Google does most of the heavy lifting (domain, hosting, design, etc.). And while you can’t customize everything you can get a nice website. It’ll be fast. It’ll function on smartphones. The whole deal. According to Google, 60% of small businesses worldwide do not have their own website. Google is clearly trying to increase that number with the rollout of its new website builder. That was a crazy number to me. We’re in 2017 and that many businesses still don’t have a website. And I’d be even more curious to see the number of businesses that either don’t have a website at all or that have an outdated website. Say 15 years, 10 years or even 5 years since the last redesign. Anyway, I think this trend will continue to improve. Google is helping. I would say that other companies will do the same. I know GoDaddy has already been doing it and so have others. But the job is complete when your site is live. That’s when more work begins. Here are some tips for getting the most out of your site once it’s live. This whole thing with your website starts with your sales process. Your website is your online salesperson. It needs to take visitors through the same process that your customers go through in real life. Someone needs a dentist. Someone directs them to your site. They want to see what services you offer. Cleanings. Fillings. Anything you do. Then they want to know about the dentists and the assistants. The office manager. They want to see the people. They want to know a few costs. They want to know the onboarding process; what to expect if they schedule an appointment. Before you even start your website you need to know your sales process. Without it your website will just be confusing content that doesn’t give the visitor what they want. The sales process will really guide you as you map out the structure or organization of your site. The site structure is also called the hierarchy too. Kind of going from the most important pages down to the least important pages or the sub pages. And how each page leads to the next. Let’s say you own an outdoor recreation rental company in your city. What are the most important products to your customers? Let’s say it’s canoe rentals and kayak rentals. Your top page might be your homepage. This describes what you offer “Outdoor Recreation Rentals” or something like that. Now, you might think that your next sub level might be “Equipment Rentals”. But we know that canoes and kayaks are huge. They deserve to be more important. So put them on the same level as “Equipment Rentals”. You don’t want to bury canoes and kayaks three levels down next to something like ice skates or roller skates. Map out all aspects of your business. From most important to least important. Including About page, Contact page, etc. When you have the hierarchy it’ll help the overall flow and the SEO too. Now your site is really setup well. You’ll get some SEO benefit over time. You’ll get traffic that way. But the results will probably be less than what you expect. Google needs to see more reason to send customers to your site. They need to know that you are the best. They need to know that you can be trusted. The reason they want this is because that’s what their searchers want. An ongoing content publishing strategy is the way to provide value to your target customers. It’s a way to build the authority of your website and your brand. The key is consistency. This is a long-term strategy. If you can’t get on board with the idea of doing it for years (with no end in sight) then it’s probably not for you. But that’s where the opportunity is. Where others quit, you can step in and commit. With your content, answer questions your audience is asking. You can choose the channel that best fits you. Pick one channel, identify common questions and answer them with the content. The content is the first step in getting more traffic. That will get you SEO traffic over the long-term. But you can boost things even more with other promotion efforts. PPC is one way. Facebook ads to promote your content. Social media is another way. Here are some tips for getting more followers and for sharing your content on social media. I’m a big fan of the idea that your site is never done. Every 6-12 months I set aside a full day to review my website. I also review my business. The sales process. Anything that’s changed. Thinking about interactions I’ve had with customers. Then I go through every page on the site. I think about content that needs to change. A few words here. An entire section there. I also think about the hierarchy. The sales process. Content is the big thing, but it might also include some design changes. A few updates to make it look more up-to-date. With the Google builder I’m sure they’ll have frequent theme and design updates that will make it easy. It’s great that Google is helping businesses with their websites. I couldn’t believe that that many businesses still had no website. And I’m sure that even more have neglected sites. Sites that were launched and then left alone after they didn’t bring in any results. That’s where the tips above can come in and help. Go through the steps above and make sure that you get the most out of your new website.